Posted November 10, 2013 at 7:46 pm . 17 comments. 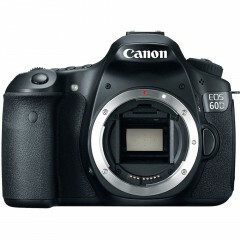 One of the best deals in the currently running Canon Direct Store refurbished sale is the refurbished EOS 60D for only $450.99. It comes with a one-year Canon manufacturer warranty. They started the sale last night and in 20 hours they’ve sold over 180 bodies. At this price, it is a fantastic deal for a great first camera, or an affordable upgrade from the Rebel line-up. The Canon Direct store has a bug right now — try clearing your shop.usa.canon.com cookies first. Bad link must be over or was a mistake. The Canon Direct store has a bug right now — try clearing your shop.usa.canon.com cookies first, and try clicking our link again. Just ordered a SL1 ($460) for a walk around camera… Kinda wondering if this is a better deal, even if the SL1 is smaller and newer. Any opinions? I already have a few 5D3s, so I’m more curious about features other than image quality. I think both refurbished deals are great — they have the SL1 + 18-55 STM for $474 or the 60D for $450. Going from a 5D3 I find the SL1 a tad too small, but it’s not a problem; it’s designed to be a compact walkaround camera! I have 5D3, 60D and recently added the SL1. Wanted something small and prefer DSLRs to my S95. If I had to pick between the 60D and SL1 I would take the 60D but the SL1 does win on size and video. Cỡ này dư sức cạch với con nikon của chú rồi nhá ! ..Thì hùi đó em phân vân giữa em này và em Nikon D7000 của em mà .